My house is a very comfortable older home built in 1924. The walls are solid brick and wood floors throughout the house. The house has two full bathrooms with tub and a shower. The tubs are the old fashion cast iron. They are large enough to stretch out in. Two of the bedrooms have a king size bed and the third bedroom has a full bed plus there is a pull out couch in the laundry room. Full washer and dryer included. We also have a 3D T.V. In the living room. I especially welcome long term guest that would like to stay 1-12 months. I charge $95 a day for long term and that includes taxes. I also welcome people that would like to stay just one night but I do have to charge $300 for one night because we work very hard getting the house ready and it does cost a lot to get it the way it should be for guest. I'm a retired teacher. I grew up in Los Angeles, California. I moved to El Paso, Texas in 1986. El Paso has a small town feeling in a nice size city. I also own a soap store and for all those staying at my place I offer a 5% discount on everything in my store just for being my guest. This house is centrally located so you can get any where in El Paso fairly quickly. 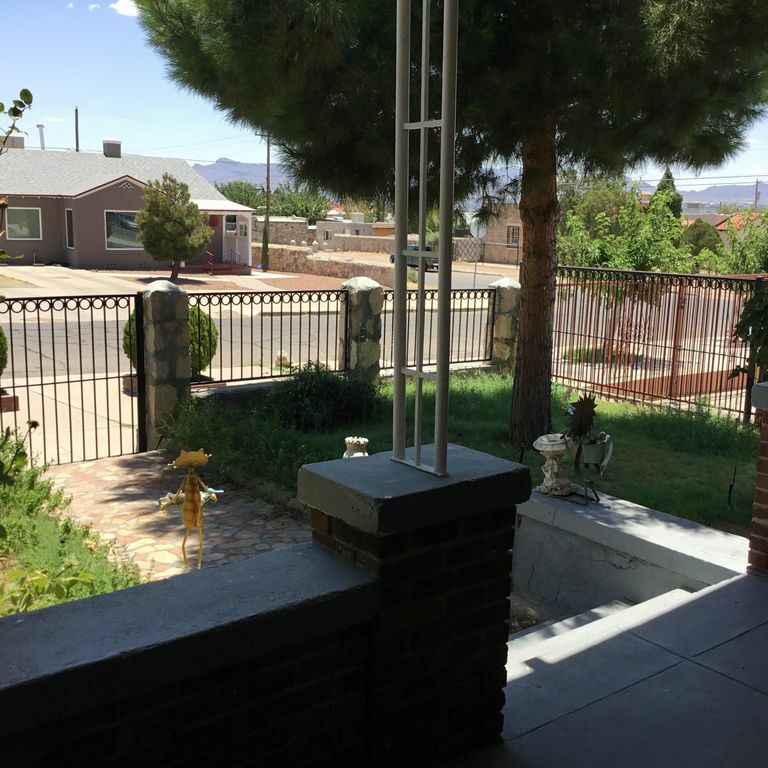 The house is located within 5 minutes from the El Paso Zoo, El Paso Library, the famous Rose Garden, Memorial Park, and a big swimming facility with a tennis court. Two full bathrooms with tub and shower. We have a 55' 3D T.V. In the living room and t.v. 's in each bedroom. Directv with all the movie channels. A t.v. in each bedroom plus one in the living room. 3D T.V. In living room. Covered patio in the front of the house. Tennis courts are within walking distance. Outside on the porch only. Centrally located, two freeways near by, 5 minutes away from the zoo. Five minutes away from international border. Two minutes away from Memorial Park, Library, and Swimming facilities. This house was perfect for our visit - a nice kitchen, good beds, pleasant living room, and great TVs in living room and two bedrooms. It is an older house, but still very comfortable. We also enjoyed sitting out on the front porch. One thing that might make a difference to future guests is knowing that the main bathroom is between two bedrooms - you have to walk through the one bedroom and bathroom to get to the third bedroom. Also the laundry room is off the master bedroom, so if someone was sleeping on the hideabed there, they need to go through another bedroom first. The owner gave us plenty of privacy but was very easy to contact if we had questions. Older house in an older neighborhood close to the airport and local shopping. Visited family for the holidays and the home provided plenty of room to spread out and comfortable to play games and do crafts. Large kitchen for cooking. Only basic cable/dish but good wifi. It provided what I needed. Owner was very accommodating during my stay. Cute house with lots of character and space. We enjoyed our stay here. Kids enjoyed having their own rooms exploring the "oldness." Good secure yard for our dog with grass and plenty of shade, would be great for little kids too. Good location. Would definitely recommend for families or groups. Thanks for the great review. Hope you guys can come back soon? I would like to offer you a 3% discount on your next stay. Way more affordable than a hotel or motel for 10 people. Tracey did a great job of making everyone feel comfortable in her home away from home rental. It was close to sites that we wanted to see. In a nice neighborhood. We were able to take grandkids for walks. And my daughter found a park nearby for kids to runaround and play. We will be back. Thanks so much for staying in my house. You guys were great too. We stayed here during a trip to see family. It was the perfect fit for 4 adults. Very cozy. Comfortable beds and clean! Everything you need is available. It’s centrally locates and east freeway access. Our group consisted of me and my husband, his 32 year old nephew, and our 20 year old daughter. There was plenty of space to accommodate everyone - including the community space. It was so much nicer than returning to a hotel at the end of the day. Owner is easy to contact and good at communicating. We will definitely be back! Thanks so much Amy for your great review. You guys were great guest as well. I really enjoyed having you here. First of all, our host was very hospitable. She messaged us prior to our arrival to ensure the home would be ready for us when we arrived. The home was clean and as advertised. There was plenty of space for us during our stay and we were able to bring our dog along which was great! We'll definitely try to come here again next time we are in town. There are many things to do and see in El Paso, Texas home of the last frontier.